The Harris's Hawk or Harris Hawk, Parabuteo unicinctus, formerly known as the Bay-winged Hawk or Dusky Hawk, is a medium-large bird of prey which breeds from the southwestern United States south to Chile and central Argentina. Birds are sometimes reported at large in Western Europe, especially Britain, but it is a popular species in falconry and these records almost certainly all refer to escapes from captivity. Adult male Individuals range in length from 18 to 30 inches and generally have a wingspan of 3.6 feet. They exhibit sexual dimorphism with the females being larger by about 40%. In the United States, the average weight for males is about 25 oz. while the female average is (36 oz). They have dark brown plumage with chestnut shoulders, wing linings, and thighs,white on the base a tip of the tail, long, yellow legs and a yellow cere. The vocalizations of the Harris's Hawk are very harsh sounds. Habitat: The bird lives in sparse woodland and semi-desert, as well as marshes (with some trees) in some parts of its range including mangrove swamps, as in parts of its South American range. Harris's Hawks are permanent residents and do not migrate. Feeding: The diet consists of small creatures including birds, lizards, mammals, and large insects. Because it will hunt in groups, the Harris's Hawk can also take down larger prey, such as jackrabbits. Breeding: They nest in small trees, shrubby growth, or cacti. The nests are often compact, made of sticks, plant roots, and stems, and are often lined with leaves, moss, bark and plant roots. They are built mainly by the female. There are usually two to four white to blueish white eggs sometimes with a speckling of pale brown or gray. The nestlings start out light buff, but in five to six days turn a rich brown. Very often, there will be three hawks attending one nest: two males and one female. Whether or not this is polyandry is debated, as it may be confused with backstanding (one bird standing on another's back). The female does most of the incubation. The eggs hatch in 31 to 36 days. The young begin to explore outside the nest at 38 days, and fledge, or start to fly, at 45 to 50 days. The female sometimes breeds two or three times in a year. Young may stay with their parents for up to three years, helping to raise later broods. Relationship with humans: Hunting While most raptors are solitary, only coming together for breeding and migration, Harris's Hawks will hunt in cooperative groups of two to six. This is believed to be an adaptation to the desert climate in which they live. In one hunting technique, a small group flies ahead and scouts, then another group member flies ahead and scouts, and this continues until prey is bagged and shared. In another, all the hawks spread around the prey and one individual flushes it. 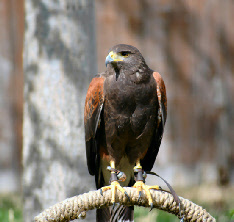 Harris's Hawk population is declining due to habitat loss; however, under some circumstances, Harris's Hawks have been known to move into developed areas. 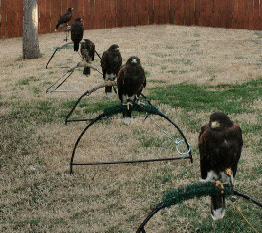 Falconry: Since about 1980, Harris's Hawks have been increasingly used in falconry and are now the most popular hawks in the West (outside of Asia) for that purpose, as they are the easiest to train and the most social.